4-shed single layer Polyester forming fabric is standard type of polyester forming fabric in paper making, mainly used for producing cultural paper printing paper, packing paper and so on. 5-shed single layer Polyester forming fabric is suitable for making healthy, culture and packing papers etc. 8-shed single layer Polyester forming fabric is the most wear-resisting one in the single layer screen, which have long performance life, but mesh print is relatively deep. 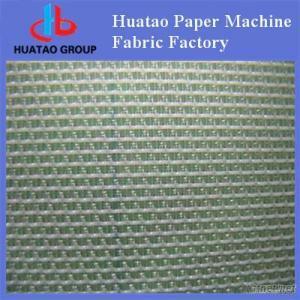 It is mainly used for copying the papermaking bag, craft paper, cardboard, corrugated paper and so on. 7-shed double layer Polyester forming fabric is suitable for quality printing paper and tissue paper etc. 8-shed double layer Polyester forming fabric is suitable for quality printing paper, tissue paper and the surface pulp and inner pulp of the board paper etc. 8-shed, 16-shed double and a half layer Polyester forming fabric is suitable for making quality printing paper, tissue paper and surface pulp, inner pulp and base pulp of the board paper etc. Multi-shed three-layer Polyester forming fabrics suitable for making quality printing paper, tissue paper and cigarette paper etc.